So, now i want to review his awesome blog! Want to see his blog? Click HERE and sudi-sudilah follow ya! Sorry ya Wilson, i'm not very good in English thus my entry will become 'rojak' with Malay and English terms. Hehe. Actually his blog also called as Ripples. Ini kata-kata hikmat sebagai pembuka blog beliau ..
Just as how the earth and the heavens and everything between them is a reflection of who God is, so is my writing a reflection of myself. Welcome to Ripples, where the lake mirrors my own image; and its depth reveals the treasures within my soul. 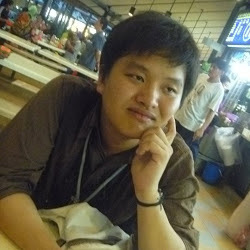 Yes Wilson, you're very clever!=) Actually memang saya setting this blog like that because don't want anybody simply copy my entries, photos or any other things in my blog. We call it as copyright and it just to ensure nobody will abuse the content in the blog. 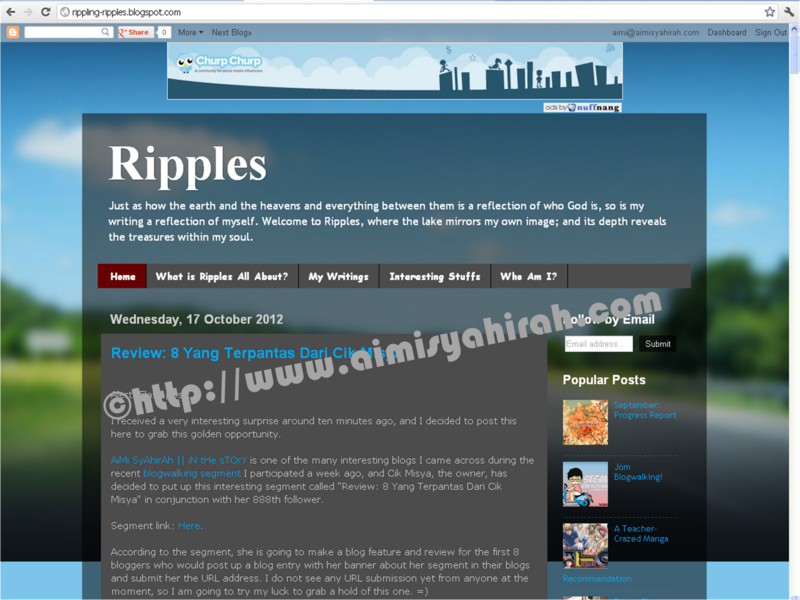 I have been running Ripples for almost a year and a half by now, but I only began blogging seriously (Not as serious as you of course, Cik Misya. You post quite A LOT in a single day! Shocking!) for a wider reader scope since the past 5 months. For those who are interested in knowing who I am, I am a Christian poet, writer and blogger. I am aware that most of you do not know me, because I only made my very first appearance in the Bahasa blogosphere recently in Adamazralicious' Blogwalking segment; but I have actually been writing for more than six years now, ever since high school, and you can actually Google for my writing by typing my pen-name, Seymour Nightweaver, into the search engine. Nevertheless, it is still my pleasure to be making my acquaintance with you. The reason why I am here? Because I am interested in making new connections and making myself known to all of you. Apart from promoting my writings (as well as my coming poetry book that I am currently working on) and expanding the reader niche for my blog, Ripples... as a writer, I am also interested in penetrating cultural barriers and learning to get to know people, even if they are from different cultural and religious backgrounds. I realised that I have forged friendships with quite a number of people from all over the world, having friends from various countries such as Japan, Korea, India, Philippine, Bhutan, Indonesia, Netherlands, Hong Kong, Mexico and even UK... but I only have a handful of friends from the Malay Malaysian community, which has been a thought-provoking revelation to me recently. Feel free to comment, ask questions and voice out your opinions as well whenever you do have any. I will be more than happy to receive them, either through your blog comment or even via email. I don't mind Facebook either. because Love heals and restores.